User Interface (UI) and User Experience (UX) plays a very crucial role in engaging visitors. Poor or average UI and UX fails to engage or create a deeper impression and thus leads to losing a potential lead/customer. Good UX design makes the site navigation seamless and optimizes the interaction between your business and potential customers. UI design is at its best when it has focused on all actions of user interactions i.e. the functionality of the website or landing page. We understand the importance of great UI and UX and so always focus on executing the required research and design process to deliver designs that would drive the conversion rate for your website. For creation of a great product, we need a great and user friendly design. To achieve this it is crucial to understand users and identify their needs and challenges. It starts by setting goals and objectives. It lays the foundation for designs, content and information architecture. Our research oriented approach delivers strategic insights on designs that supports users’ needs as well as your business goals. User Interface is the way in which the user interacts with your product. The perfect UI ensures easy access and facilitates the actions. It instantly connects the user with your product. We strive hard to create well-designed UI and believe in delivering competitive designs with pleasurable UI. Information Architecture ensures that right information is being displayed at right place. Wireframes are created to showcase the arrangement of elements in best possible way to accomplish your purpose. It is important to have a website or app that is well organised, consistent and intuitive. Mockup is a prototype which forms the base of a system and design of a product, used to acquire the feedback of prospective clients and users. These mockups can also be utilized to understand the responsiveness of the customers. Ninjamock is a tool which gives a visual shape to your ideas. It consists of a vector editor. It has required templates for creating prototypes. We made the best use of Ninjamock for creating many of our apps which are compatible with Android, iPad, iPhone, etc. Mockflow is another tool for designing and collaborating UI mockups for distinct apps, software and websites. It assists in envisaging the interface, arrangement and navigation of a website in remarkably lesser time than usual. Graphical designs are created to demonstrate your business with beautiful designs, layouts and illustrations. Our experienced graphic designers designs the websites and apps keeping your business needs in mind. They are able to envision how and which designs can engage more customers with your product. They bring life to the ideas that you have with their creative imagination ability, perfect layout and excellent and suitable colour palette. We provide our graphic designing services for designing creative logos, brochures, banners, beautiful websites and innovative mobile apps. After designs are completed, testing the interface is important. We follow the procedure of testing the interfaces with real users to test the overall usability. Based on these observations designs are then refined to deliver the best designs that meet your business goals.We understand the importance of all the crucial steps involved in creation of website or mobile app designs. Team Krify will help you bring your imaginations to life through beautiful designs. Our creative team of Designers is specialized in creating incredible UI/UX designs by working closely with our developers resulting in many first of its kind Mobile apps. Our designs complement the needs of our clients. 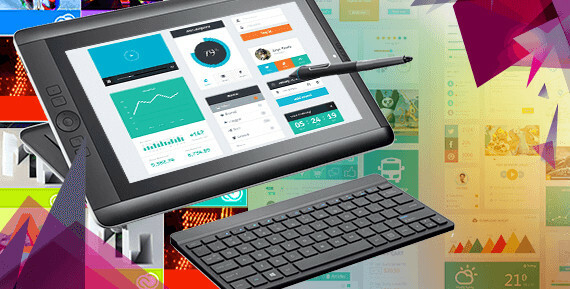 User Interface is a critical task when it comes to designing apps which must be compatible to function effectively in varied devices, as the resolutions and graphics of the devices are not uniform. We strive to create the best designs and UI for the users of our Mobile apps. We are experienced in creating unique apps for Android phones, iPhones, iPads, tabs and Smart Phones. Also, all these apps are compatible with most of the web browsers. Website Redesigning is not just about getting a new look, but it is about offering what visitors are looking for. Template Designing is an integral and very important part of website designing. Effective graphic designs are important for strong online presence. Looking for services like UX and UI designing or website and app development, contact us today, let’s create it together!